An assumption in classical economics is that firms seek to maximise profits. Profit = Total Revenue (TR) – Total Costs (TC). Therefore, profit maximisation occurs at the biggest gap between total revenue and total costs. To understand this principle look at the above diagram. 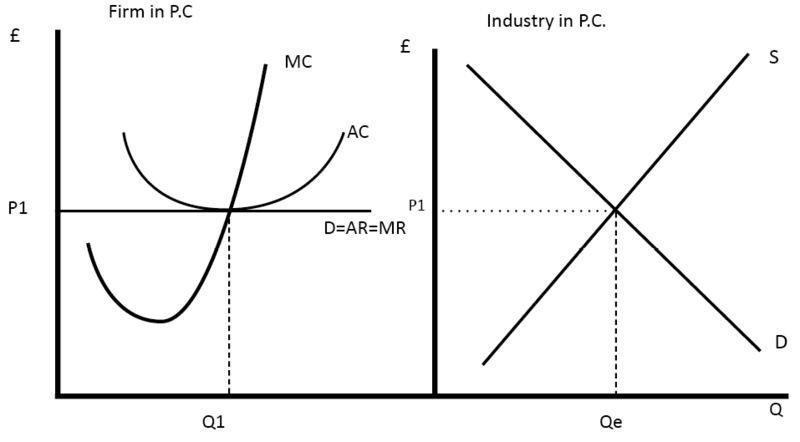 If the firm produces less than Q1, MR is greater than MC. Therefore, for this extra output, the firm is gaining more revenue than it is paying in costs, and total profit will increase. Close to Q1, MR is only just greater than MC; therefore, there is only a small increase in profit, but profit is still rising. However, after Q1, the marginal cost of the output is greater than the marginal revenue. This means the firm will see a fall in its profit level because the cost of these extra units is greater than revenue. 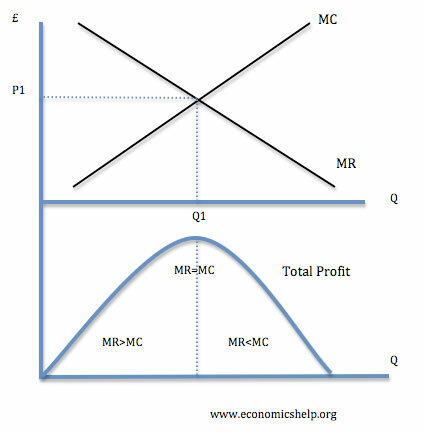 In this diagram, the monopoly maximises profit where MR=MC – at Qm. This enables the firm to make supernormal profits (green area). Note, the firm could produce more and still make normal profit. But, to maximise profit, it involves setting a higher price and lower quantity than a competitive market. Note, the firm could produce more and still make a normal profit. But, to maximise profit, it involves setting a higher price and lower quantity than a competitive market. In perfect competition, the same rule for profit maximisation still applies. The firm maximises profit where MR=MC (at Q1). For a firm in perfect competition, demand is perfectly elastic, therefore MR=AR=D. This gives a firm normal profit because at Q1 AR=AC. In the real world, it is not so easy to know exactly your marginal revenue and the marginal cost of last goods sold. 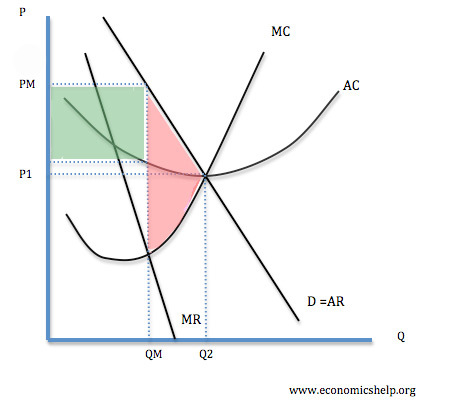 For example, it is difficult for firms to know the price elasticity of demand for their good – which determines the MR. It also depends on how other firms react. If they increase the price, and other firms follow, demand may be inelastic. But, if they are the only firm to increase the price, demand will be elastic (see: kinked demand curve and game theory. It is difficult to isolate the effect of changing the price on demand. Demand may change due to many other factors apart from price. Firms may also have other objectives and considerations. For example, increasing price to maximise profits in the short run could encourage more firms to enter the market; therefore firms may decide to make less than maximum profits and pursue a higher market share. Firms may also have other social objectives such as running the firm like a cooperative – to maximise the welfare of stakeholders (consumers, workers, suppliers) and not just profit of owners. Profit satisficing. This occurs when there is separation of ownership and control and where managers do enough to keep owners happy but then maximise other objectives such as enjoying work. Very good. Helped me with my FDCR Business and Economics Application exam. I have a question. Overridding objective of a companies?